(from left to right): Cian Binchy, Ambitious about Autism’s Youth Patron; Jolanta Lasota, Chief Executive of Ambitious about Autism; Children’s Minister Edward Timpson MP; Martin Hewitt, parent of a pupil supported by Ambitious Support; and Hong Thanh, parent of pupil supported by Ambitious Support. Children’s Minister Edward Timpson MP visited Ambitious about Autism today to meet young people with autism and speak to parents whose children are supported by its post -16 service Ambitious Support. He also met Cian Binchy, a Youth Patron for Ambitious about Autism. The Children’s and Families Minister toured the charity and its flagship service TreeHouse School and took part in a roundtable discussion with parents and Cian Binchy about the special educational needs and disability reforms currently going through Parliament. He also watched TreeHouse School pupils take part in a Maths lessons and work in the school’s allotment. “Our reforms through the Children and Families Bill will ensure that every young person with special educational needs gets the quality education they need as they progress from school to adulthood and independence. “We were delighted to welcome the Children’s Minister to Ambitious about Autism and TreeHouse School to meet parents and discuss how the special educational needs reforms will affect their lives. It shows the Minister’s commitment to improving services for children with autism and their families that he listened to their concerns and spent time discussing the priorities for implementing the changes. 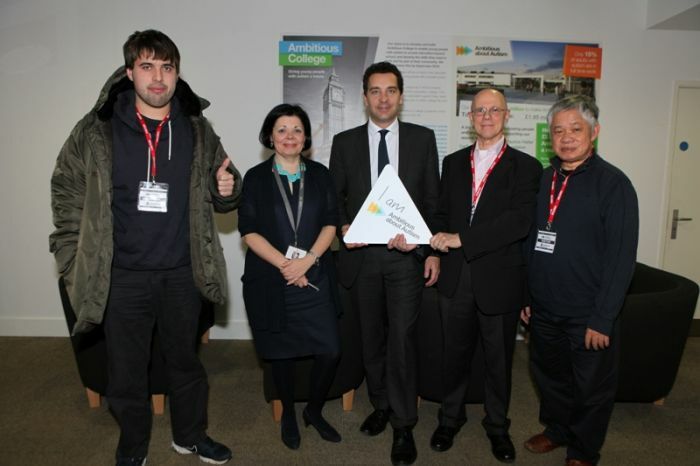 Be the first to comment on "Children’s Minister Edward Timpson MP visits Ambitious about Autism"